Brightmetrics is a Mitel (formerly ShoreTel) telephone analytics product like you’ve never seen before. Our data feeds come from multiple sources, available to be configured in any manner that works for you and with the opportunity to dive as deep into the data to make the best business decisions for your organization. Brightmetrics is a Mitel MiVoice Connect telephone analytics product like you’ve never seen before. Our data feeds come from multiple sources, available to be configured in any manner that works for you and with the opportunity to dive as deep into the data to make the best business decisions for your organization. Brightmetrics can use your historical data (with granularity of 60 minutes) to determine your projected call load, average handle time to help recommend how many team members you’d want to staff. Our Staffing Level Forecast Report feature can improve your efficiency and the probability of delivering the service level targets you set for average queue/wait time per call. Contact center managers with Mitel MiVoice phone systems and Connect Contact Center know they need to make data-driven decisions but have found that getting to the data to discover insights can be incredibly difficult. For that reason, Brightmetrics developed the Enterprise Contact Center (ECC) Analytics add-on service. We wanted to develop a service that democratized access to the most important metrics for delivery of this business intelligence to the fingertips of every key stakeholder involved. Available for Mitel MiVoice Connect Contact Center customers, this add-on caters to the many unique data reporting needs of enterprise contact centers. Contact center managers know that data is vital to the ability to design the best customer experience possible. 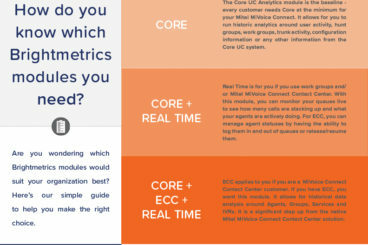 Brightmetrics ECC allows you to apply the outstanding analytics available in Brightmetrics to your contact center. Brightmetrics can use your historical data (with 15 minute granularity) to determine your projected call load, average handle time to help recommend how many team members you’d want to staff. Our Staffing Level Forecast Report feature can improve your efficiency and the probability of delivering the service level targets you set for average queue/wait time per call. Despite the fact that Brightmetrics data is incredibly up-to-date at up to an hour old, sometimes you need data as it happens. That’s where Brightmetrics real time comes in. Designed to provide analytics that show the customer experience as it happens, Brightmetrics Real Time is ideal for contact center managers who are in the trenches and have the opportunity to change the way your employees work to meet customer needs. Wondering exactly what Brightmetrics can offer you? Here are your guides. 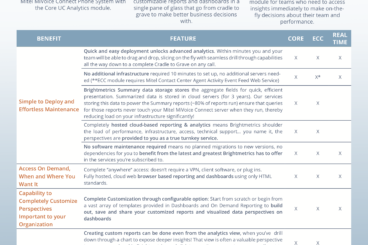 Our Cheat Sheet is a quick read on choosing what modules your organization needs. Check out the Features and Benefits Brochure to dive into a list of every single insight you have access to in Brightmetrics. Start your free trial today and benefit from the business intelligence Brightmetrics can provide you.